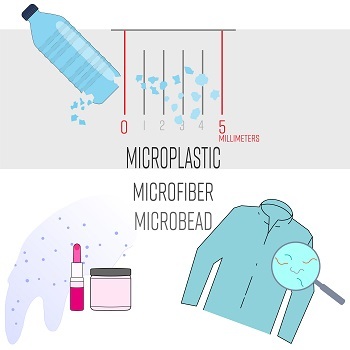 Microplastics include all the small pieces of plastic that measure less than 5mm. These tiny particles come from numerous sources, including synthetic clothes, cosmetic products, household cleaners, and dust from paints and tyres. Microplastics can be put into two major groups, with some particles designed to be small from the outset and others created from the breakdown of larger plastic items. While some forms of plastic don't break down easily, others turn to dust quickly when they age or become exposed to certain environmental conditions. Regardless of where they come from, microplastics cause numerous problems when they accumulate in places that haven't been designed to handle them. Whether it's your home, your workplace, or even your food supply, exposure to microplastics can have a damaging effect on organic and biological systems. Microplastics have already become a common feature in the world's water supply, with microscopic fragments of plastic found in 83 percent of water samples worldwide according to a study published in 'The Lancet Planetary Health' from late 2017. Even though plastics have been around for decades, the negative health effects of these tiny particles is still unclear. What we do understand is very worrying, however, with many of the basic chemicals found in commercial plastics known to be toxic to human health. For example, BPA and phthalates are two common endocrine-disrupting chemicals that may interfere with natural human hormones. Flame retardants are another big problem, with these particles possibly interfering with brain development in foetuses and children. Plastic microparticles could also become carriers for other toxins to enter the body, including toxic metals such as mercury, and pesticides and dioxins that are known to cause cancer. Nanoplastics are also increasing in the environment, with these extra-tiny particles measuring just 1 to 100 micrometers in length. Nanoplastics could potentially enter human cells, with ongoing exposure to these robust particles happening at a much faster rate than we can regulate or control. While there is still no clear evidence that these tiny particles cause problems, calls are being made for policy makers across the world to start regulating the plastics industry before it's too late. Any future studies into microplastic consumption will be difficult to apply, however, with observational studies open to confounding and experimental studies both impractical and unethical. According to the World Health Organisation (WHO), there are over six million global deaths each year associated with air pollution, with microplastics recognised by many as the next frontier where human health and environmental pollution will converge.